Lauren was one of the most prolific style icons of the 40s and 50s, thanks to her effortless glamour, timeless bob and raspy drawl. On screen, the actress wore sharp, masculine suits, slinky evening gowns and striking red lipstick - all of which continue to look fabulous today. 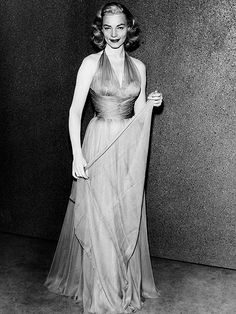 Lauren believed you shouldn't have to "do too much to clothes", just wear them.For evening, draped gowns and nipped-in waists, that were so prevalent during that era, were Lauren's go-to look. You can find several examples of these gorgeous gowns at the InspirationSL Event, three of which are shown here. The lovely Starlet Gown by BBS is available in three colors and created for Belleza, Maitreya and Slink Mesh Bodies. The dazzling Audrey Gown by Emerald Couture comes with shoes for slink high feet and arm length gloves. The gloves come with a unique hud.. that offers six poses for positioning of your hands! This lovely ensemble is available in seven colors. The sparkly Shimmering Gown by ArisAris/B&W includes hud that offers 4 different sequin colors. With New Year's Eve rapidly approaching.. hurry over to InspirationSL and choose your gown to ring in the New Year! The "little black dress" is considered essential to a complete wardrobe by many women and fashion observers, who believe it a "rule of fashion" that every woman should own a simple, elegant black dress that can be dressed up or down depending on the occasion: for example, worn with a jacket and pumps for daytime business wear or with more ornate jewelry and accessories for evening. 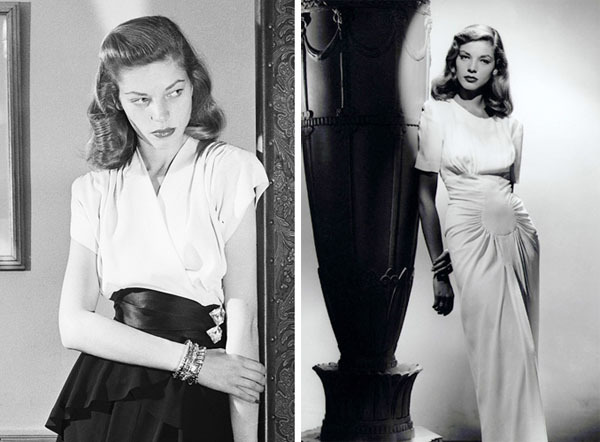 Hollywood femme fatales and fallen women characters were portrayed often in black halter-style dresses in contrast to the more conservative dresses of housewives or more wholesome Hollywood stars. everything you need for an evening out! This ensemble is currently available at the InspirationSL Event. You can be Glamorous too! The Hollywood Glamour Round of InspirationSL opened its doors a few days ago, and let me tell you.. there are so many fabulous things to check out! You definitely don't want to miss this gorgeous Gala Eyeshadow by Dulce Secrets.. (there are seven shades! and has appliers for Catwa and Omega AND tattoo layers!) and paired with the lovely Lauren hair by Indulge Temptation you're sure to feel like a glamorous movie star yourself! So... stop by InspirationSL today.. with just a few days until Christmas, you might find the perfect last-minute gift for that 'hard to shop for' person on your gift list this holiday season. Hi! I'd love to join your feed! 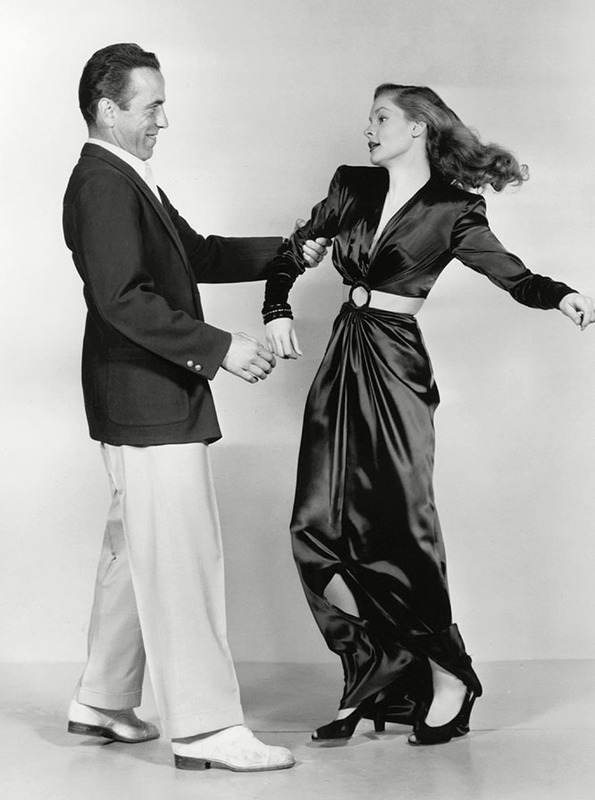 Bogart & Bacall, December is Hollywood Glam! 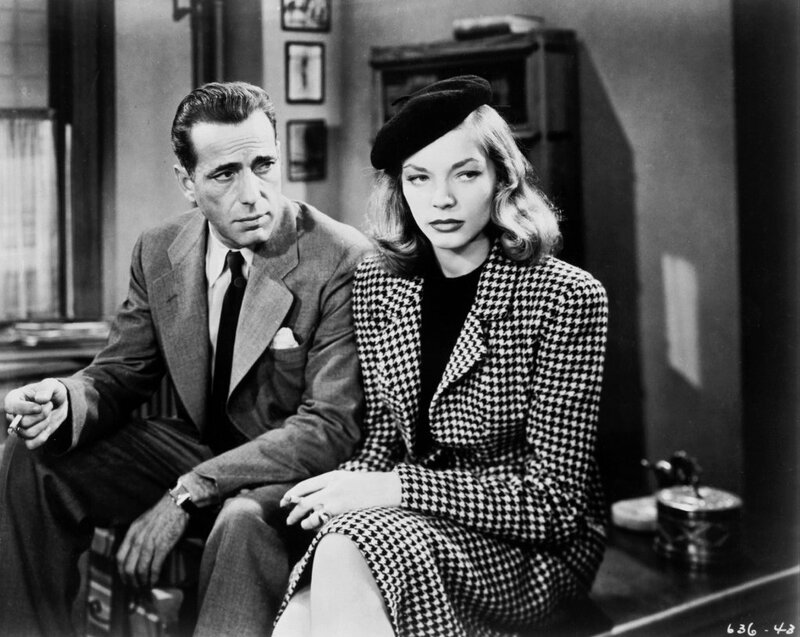 Few Hollywood romances are as legendary as Bogie and Bacall’s. 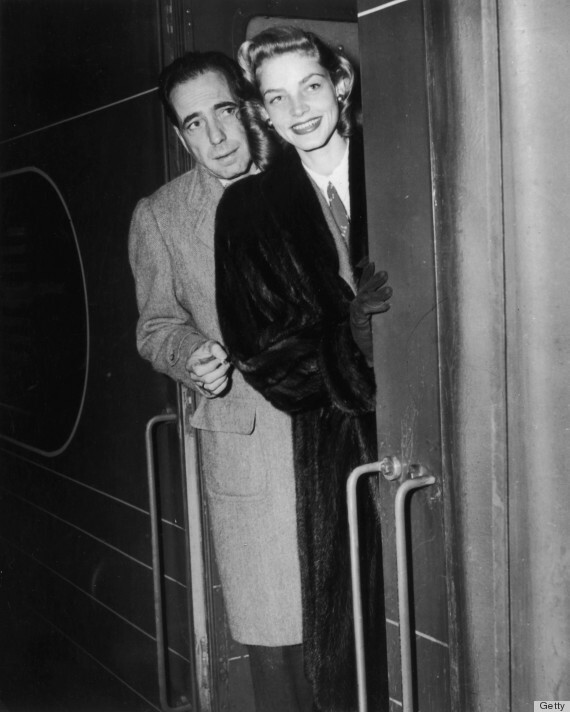 Lauren Bacall was just 19 when she met a married Humphrey Bogart on the set of 1944’s “To Have And Have Not,” but their 25-year age gap and Bogart’s marital status didn’t seem to stop a romance from forming. 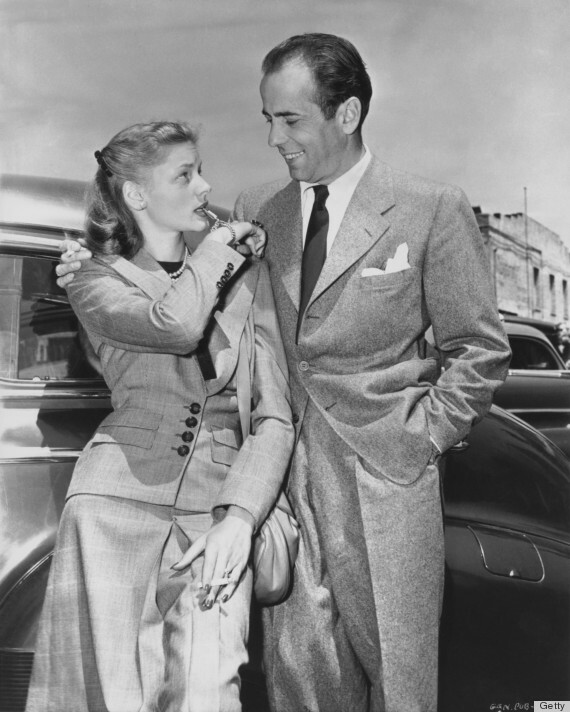 It only took a few months for Bogart to get a divorce and pop the question to the young blonde actress. The two were married on May 21, 1945 and stayed blissfully wed until his untimely death in 1957. Humphrey always had an eye for style. His mysterious persona and perfectly groomed attire made him the perfect package. His style seemed effortless and simple, yet showed all the details a man like him would require. 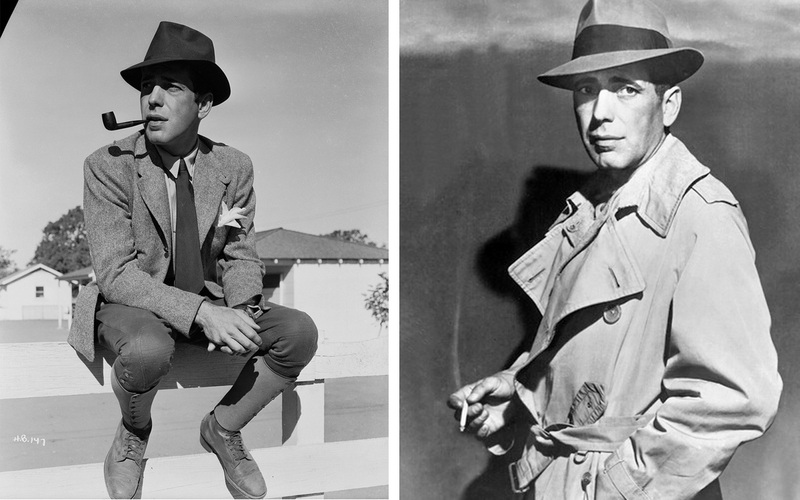 A leading man on screen and off screen, Bogart was never seen out of formal wear. Always wearing head-wear and holding a cigar that seemed to burn forever. He exuded elegance in every aspect of his life. Taking inspiration from this iconic man is a sure fire way to get noticed. 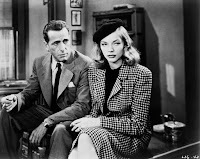 So what did Bogie, a living silver screen icon, see in Bacall? Aside from her wit, talent and that gaze, the lady had great style. Sharp 1940s suiting and pristine, structured tailoring lent the ingenue an air of maturity beyond her years. So in the words of the great Humphrey Bogart, “Here’s looking at you, kid.” We'll see you in December for Hollywood Glam! Many Thanks.. and See you in December! As another round draws to a close, it's once again time to thank you guys, our loyal shoppers and visitors, for the continued support! You totally rock; you've liked and shared our blog posts, shopped until you dropped, and lusted after all things InspirationSL! You guys are amazing! We'd also like to extend a massive thank you to the team at InspirationSL: designers, bloggers and management team alike! We have an amazing team here, and we couldn't have done it without you all! We're already planning December's event, and can't wait for you to rejoin us... You're in for a treat with Humphrey Bogart and Lauren Bacall as our Inspiration.. we'll be glamming it up, Hollywood Style! If you'd like to join the Inspiration team as either blogger or designer, here's how to do it! 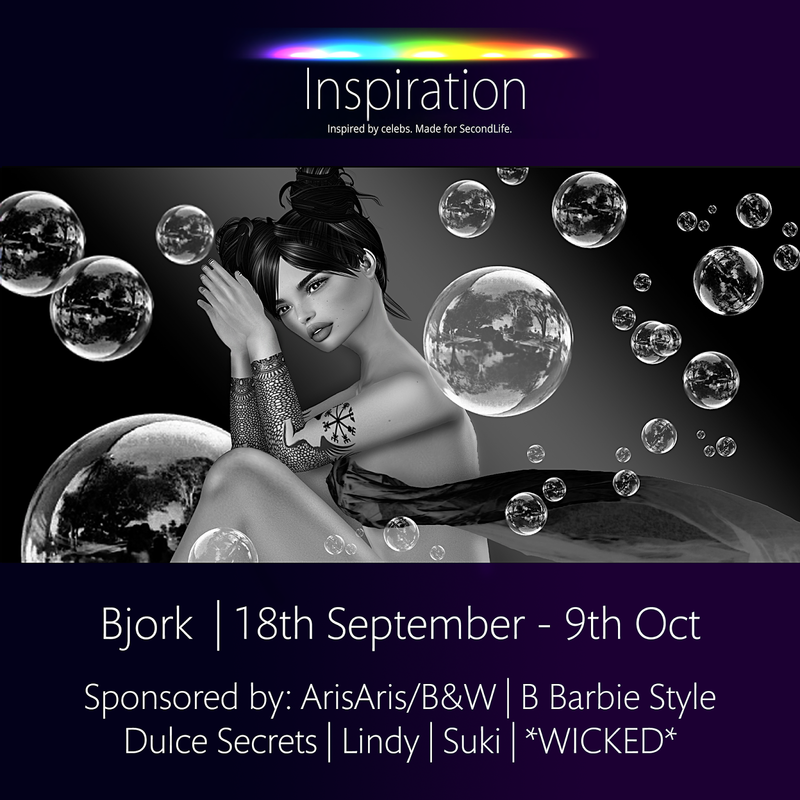 We start out our third week of of the Björk inspired round for the InspirationSL Event featuring Wicked and Lindy Modern & Retro Shoes. Wicked has created a fun dress that perhaps even Björk herself would want to add to her closet! The shoes by Lindy are vibrant and colorful.. much like Björk herself. We can learn a lot from Björk's songs, as they have messages about how she views life. For example, the lyrics to "Crystalline" talk about the process of crystallization in minerals and rocks but taking a more personal point of view, relating the growth of a crystal structure with the growth of relationships in people's hearts. This short and sassy dress by Wicked comes in the five standard mesh sizes. There are seven colors available. Choose between four colors for the zipper on the hud provided. These fun and colorful shoes by Lindy are made for Slink and Maitreya High Feet. We start out our second week of the Björk inspired round for the InspirationSL Event featuring B Barbie Style and Dulce Secrets. B Barbie Style has created a perky youthful ponytail.. much like Björk herself... who has remained vibrant and youthful throughout the decades. Dulce Secrets designed lovely eyeshadow, named Hunter.. in reference to the song of the same name by Björk. The lyrics of "Hunter" explore the pressure Björk felt to write music after realizing the workforce that depended on her, following the success she found as a solo artist with her previous studio albums. New Eye-Shadow by Dulce Secrets, inspired by Björk! The Hunter Shadow includes the Catwa and Omega appliers, as well as tattoo layers! Choose your favorite from six options on the hud provided. Don't you just love this fun, perky ponytail by B Barbie Style?! Much like björk’s voice, the moon is ethereal.. Smooth, intoxicating, soothing, joyful… you get the idea! ... The ethereal dress by ArisArisB&W has smooth curves and fun fringe. Or you can remove the fringe for a more mellow, refined look. The dress is available in the five standard mesh sizes and fitted for Maitreya and Slink Mesh Bodies. There are eight designs to choose from on the texture hud.. And don’t forget.. you can remove the fringe too! The Vegvisir Earrings by Suki are fun and interesting, much like björk’s personal style.Available in black, copper, gold and silver. Choose your favorite.. Or get them all! So in just under 2 weeks time (18th Sep) InspirationSL will open its doors to a world of everything Bjorky! But why did we choose Bjork you ask? 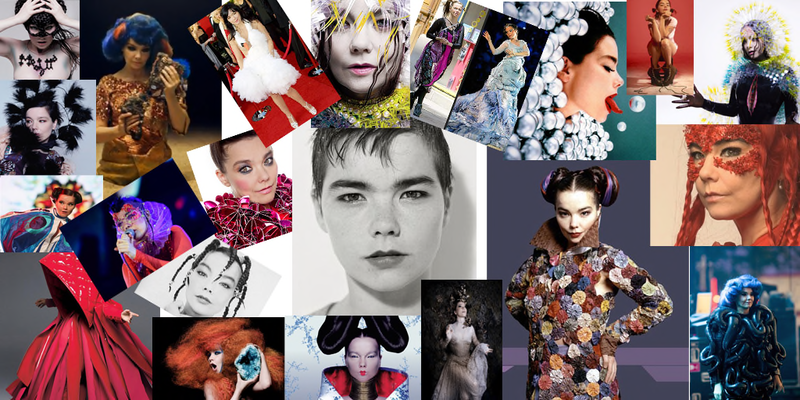 Over the years we have seen the many faces of Bjork pushing the stylistic boundaries of fashion to the max! Not only have we seen Bjork in many different styles but she has set the standards for other music icons such as Gwen Stefani in the 90s, RiRi even went for the green lippy and Bantu knots but much more recent was Jessie J in the UK The Voice. They have all grasped at inspiration for looks and music from none other than Bjork. This lady has one way or another has always been seen and heard weather it was worn by another celeb or even the famous swan dress that was featured in the film "White Chicks" we have all seen aspects of her career. Watch this space for more information on the event! 2 Weeks and counting people!!! i can hardly contain myself! So just to leave you that little bit more excited let me give you some information about the icon that is Bjork. 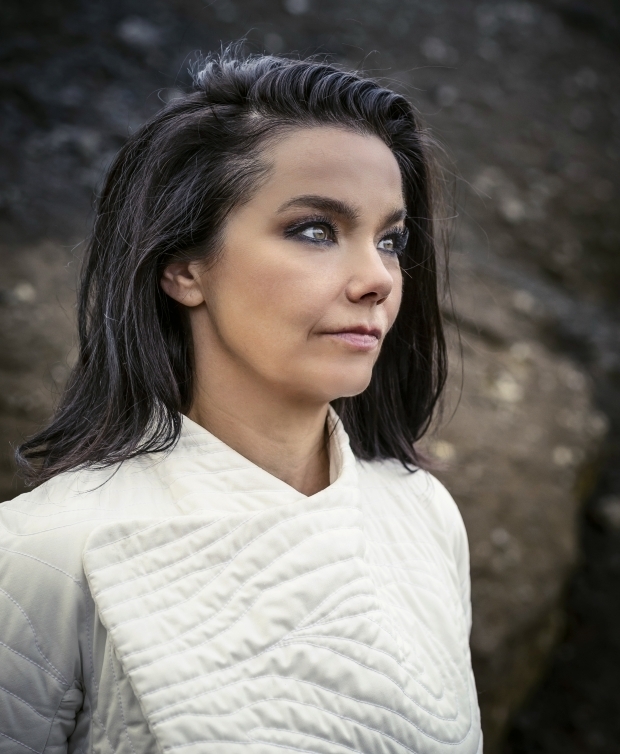 Over her three-decade career, The Icelandic singer-songwriter has developed an eclectic musical style that draws on a wide range of influences and genres spanning electronic, pop, experimental, trip hop, dance, classical, and avant-garde styles. She initially became known as the lead singer of the alternative rock band The Sugarcubes, whose 1987 single "Birthday" was a hit on US and UK indie stations and a favorite among music critics. Björk embarked on a solo career in 1993, coming to prominence as a solo artist with with albums such as Debut (1993), Post (1995), and Homogenic (1997), while collaborating with a range of artists and exploring a variety of multimedia projects. Several of her albums have reached the Top 20 on the Billboard 200 chart, the most recent being her 2015 album Vulnicura. Fashion wise Björk was an early fan of Martin Margiela, Walter Van Beirendonck, and Alexander McQueen, but it was in the noughties that she embarked on artistic collaborations with the fashion industry. The Marjan Pejoski–designed swan dress she wore to the 2001 Academy Awards, following her starring role in Lars von Trier’s Dancer in the Dark, remains her strongest visual statement to date. She worked on album covers and coffee-table books with sleek French design firm M/M (Paris) and fashion photographers Inez and Vinoodh. Her most celebrated music video of the period is “Pagan Poetry,” directed by fashion favorite Nick Knight, which was banned from MTV in part for its explicit sexual imagery. Even now this lil lady seems to be defining the decade by going big: big hair, big costumes, big concepts, big museum shows. Her 2011 record, Biophilia, was billed as an “app album,” and was released in conjunction with a series of apps that let you visually explore its songs in depth. Her most recent, Vulnicura, released in January. Are you as excited as we are?? So in the last blogpost we shared a picture of our inspirational celeb, How many of you guessed the Beauty in Black and White? If you guessed BJORK then you guessed CORRECTLY! Watch this space for more news about the event! 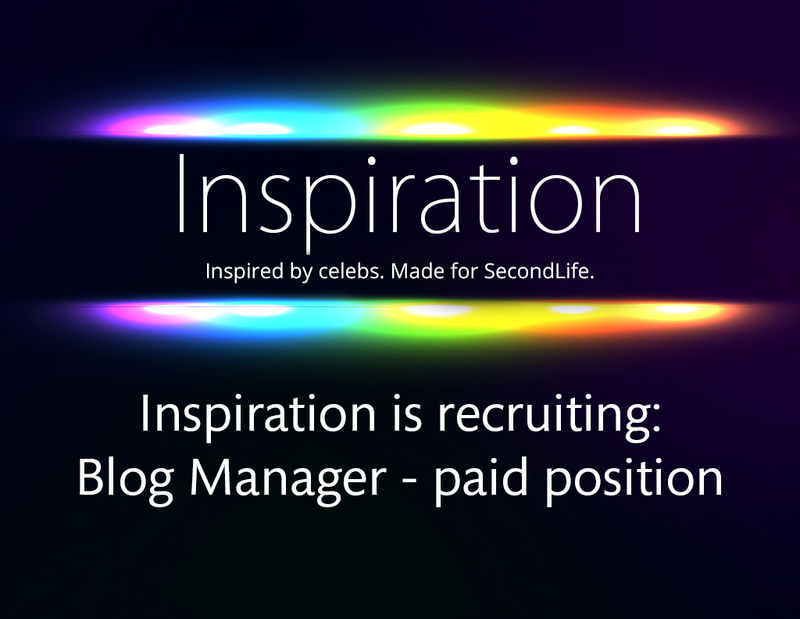 InspirationSL is looking for a committed Blog Manager. We are looking to hire an experienced, committed blog manager as part of our growing team. As an integral part of our team, you will be responsible for ensuring the Inspiration website is up to date at all times. You will be required to make a minimum of 9 blog posts for each round (schedule below), and ensure the general upkeep of the site. Part of the role involves sharing your posts on social media sites to reach as many potential customers as possible. You will also update the site with logos and vendor ads for each round. A big part of this role is taking creative pictures to showcase our designers in the best light possible, and it's really important you're able to write succinct, accurate and interesting text to accompany each post and engage with our readers. Credits only is not something that we are looking for, and you must be able to demonstrate your writing ability. We want our blog to captivate with both the writing and photography. You will be managed by co-owner PinkRayne, who looks after bloggers and blogging activity for the event. You may also need to liaise with co-owner Trinity.Yazimoto who looks after our designers and builds our event sets for each round. Posts required are as follows, and you are free to add more should you wish. Introduce round - who is celeb? Coming soon (2 month prior to opening). As you can see from the above timeline, a minimum of 9 posts are required. If you are interested in this position, please apply here. You should provide as much detail as possible in your answers. Thank you muchly! See you in September! It's not all bad though, we'll be back and bigger than ever in September. We're going dark. We're going weird. We're going eerie and eccentric as hell... get ready for September 18th... can you identify the celeb below?! As we enter our third and final week at InspirationSL, we wanted to share with you some of the work of our incredible blog team! Check out their amazing creativity and awesome styling below.Thank you girls, you rock! If you'd like to apply to blog for InspirationSL, please see our blogger page, and good luck! Check out this top and jacket combo by * WICKED *, available at InspirationSL. I love how the soft, pastel colours collide with red cuffs and stripes, giving it a punky, fresh feel. It's a great top to team with a pair of jeans, making you appear effortless but 100% rock chick. I think this top would also look awesome with a mini skirt, perfect for a night out on the tiles. I teamed this top with hair by Love, also available at InspirationSL because the red dip-dye style compliments the jacket by * WICKED * perfectly. Visit today and grab some Bowie style! Remember those days when choices didn't have consequences, and if they did, you just didn't care?! I remember being told I wasn't allowed to go out clubbing with my friends one night in my teens, so I bundled a little black dress into a bag, climbed out of my bedroom window and jumped down into my garden below. I ran all the way to my friends house, where we got changed, sweet-talked the bouncers at our favourite club and then danced the night away. We sipped drink after drink, mingling with people my parents would have disapproved of. I was a bad influence on all my friends, a total Rebel Rebel. Don't you love those crazy, crazy minutes where you put on a record and dance like an utter fool around your bedroom? The feeling of only the music, and the delicate rhythm creating soundwaves that tickle your skin. The feeling of closing my eyes and getting lost in the beat, screaming out the lyrics and swirling, twirling, entering a state of pure bliss, just me and my air guitar. 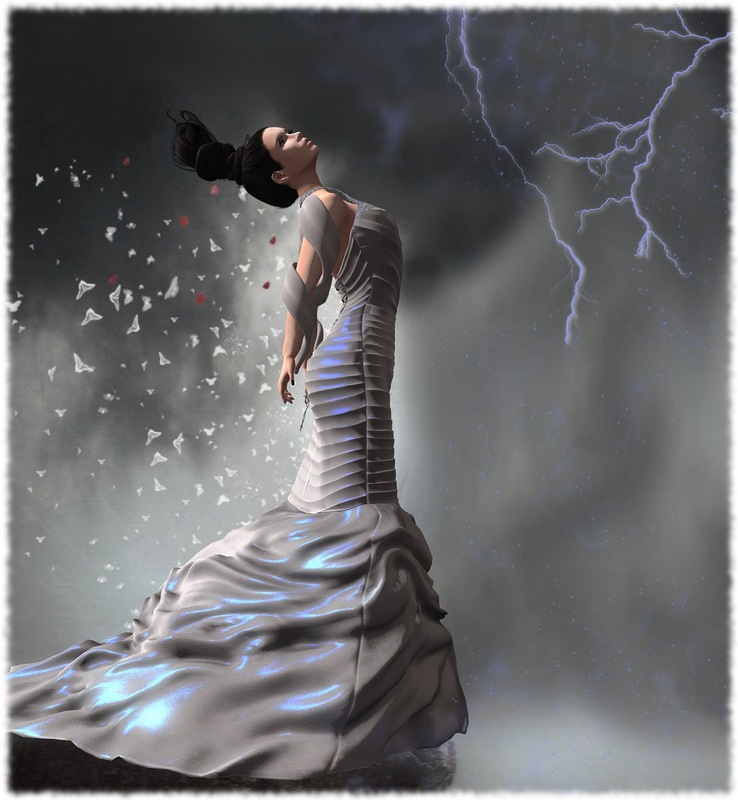 The poses created by Pose It for InspirationSL give me this awesome feeling! They're so kooky and cool. They turn me into David Bowie himself. I am the rock god, I am the legend, I am a total champion. I decided to wear Lushish Catz Rebel Star outfit because the name was so fitting! I adore the tie-side shorts and the subtle tribute to Bowie printed on the cropped tee. It's a really fun outfit and comes with 2 versions for one price: black and white tie-side shorts, and 2 version of this cute cropped top (demonstrated above and below). Get boththe poses and outfit at InspirationSL, then all you need to do is add your air guitar and close your eyes! BOWIE is here! InspirationSL is officially OPEN! I am so excited to announce that InspirationSL June is now officially open! Come and join in the fun and shop items that are all Bowie inspired, with original mesh accessories inspired by his Lazarus video, glam-rock style makeup, rock star poses and gorgeous outfits, InspirationSL is daring you to be a Rebel Rebel, and shop until you drop! Don't forget our amazing giveaway too, every 100th (200th, 300th, etc.) customer will receive a bundle of 3 exclusive items from that round, will you be the lucky shopper?! In our featured photo above, the mischievous Ladyblance is wearing Dulce Secrets eye makeup, because we love the bright, bold metallics of her Galactic Eyeshadows. They represent our Bowie theme perfectly, and it was a hard choice, as she has another three sets to choose from that you won't want to miss! Teleport to Mars NOW to join in the dystopian fun! PS Thanks to the gorgeous Ladyblance for posing for me! Did you guess the film from the tagline? Of course it's from the cult film 'Labyrinth', in which David Bowie plays the Goblin King, who has stolen a baby from his young sister. As she tries to track Jareth the king down, she becomes trapped within the labyrinth, confused by it's riddles and tricks. 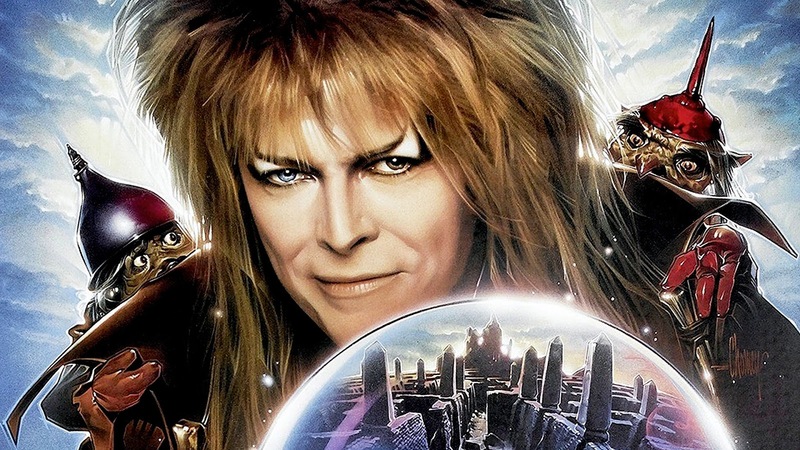 Bowie was the perfect choice for the role of Goblin King with his glam rock, flamboyant style. 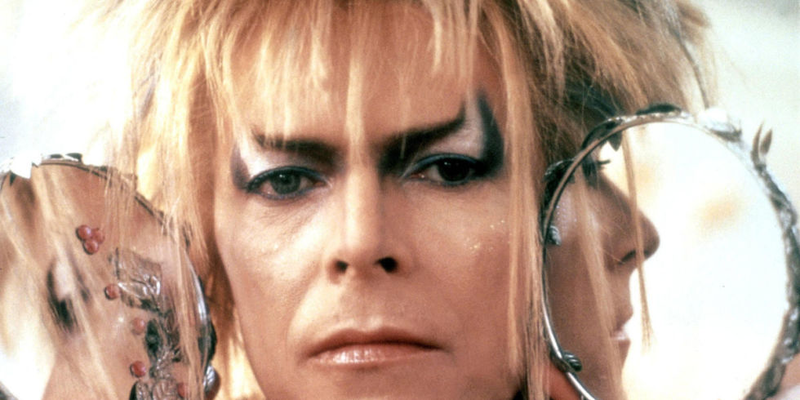 This style continues throughout the film, and takes on a fantasy twist, as Bowie rocks us through a series of memorable songs. As a homage to King Jareth, here is 'Magic Dance' for you to enjoy, whilst you wait just 3 more days for Inspiration to open! Who is David Bowie? 8 DAYS TO GO! David Bowie was an English singer, songwriter, actor and producer and was in the music industry for over 5 decades, He was awarded a place in the rock and roll hall of fame in 1996 due to an estimated 140 million record sales worldwide, making him one of the world's best selling music artists. Bowie's music was groundbreaking and unique, and he filled the rock and roll scene with sounds and styles nobody had heard or seen before. During the glam rock period of the early 70s, Bowie had already been in the music industry for about 10 years, but at this stage he transformed himself into his alter ego Ziggy Stardust who represented flamboyance and androgyny. Bowie was the king of changing styles, and after a year as Ziggy, his style and appearance changed again and again as he proceeded to dabble in soul/funk (late 70s), new romance (80s), electronica (90s) and neoclassicism (noughties). Bowie also starred in some fantastic films, including 'The Man Who Fell to Earth', 'Merry Christmas, Mr Lawrence', and of course the dark fantasy movie 'Labyrinth' in which he plays the King of Goblins, Jareth. So what will our designers create for this round? Will it be fantasy? Androgyny? Rock and Roll? You'll have to wait and see, but you can check out our shopping guide for a small selection of what's on offer, and in the meantime enjoy a song from the starman himself! 3 WEEKS TO GO... THE COUNTDOWN BEGINS! 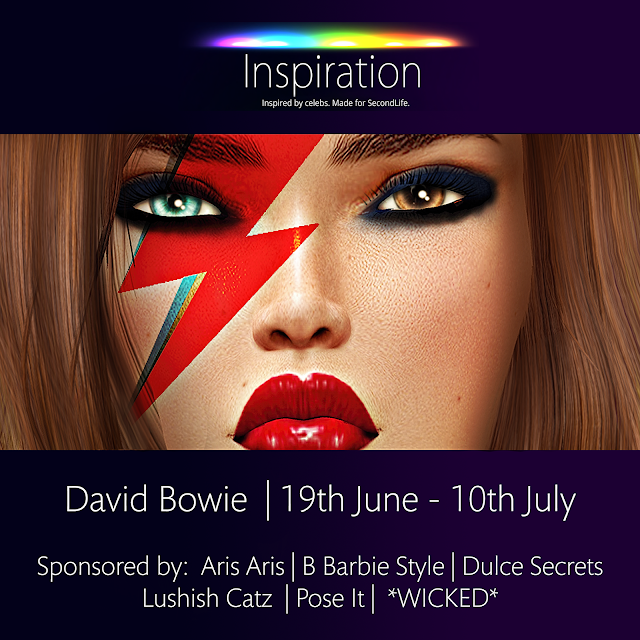 Androgyny, Glam Rock and out of this world fashion comes to InspirationSL, June round. Our inspiration? The starman himself, David Bowie! To whet your appetite, here's a tiny taster of what's to come! Sunday 19th June... we're ready, are you? Thank you all, see you in June! Customers, designers, and bloggers! InspirationSL closed it's doors yesterday after a whopping success, and the team here want to extend a huuuuuuuuge thank you for everyone that supported us this round. We're already planning June's event, and we can't wait for you all to rejoin us... so you've been warned, get ready for the 19th of June.. because DAVID BOWIE comes to InspirationSL! InspirationSL is now in it's final week, so if you haven't visited already this is your final chance! There are still many prizes to be won for every 100th customer, so make sure to visit to spruce up your Spring wardrobe and enter our 100th customer raffle. Check out more of our gorgeous bloggers work below too whet your appetite! Here's your cab! Our blogger team have been so AMAZING I couldn't resist showing more of their gorgeous work today. All the beautiful designs on display are by Petit Chat, RAYNE, Modern Couture, Mariposa, Luane's World and IT! and can all be bought at InspirationSL. Today we're showcasing some more of our favourite blogger work from this round of InspirationSL: Shania Twain. We've had some truly beautiful blog posts, and we adore our blogger team! Enjoy the pictures that they've created and visit InspirationSL here to buy the items that are on display.